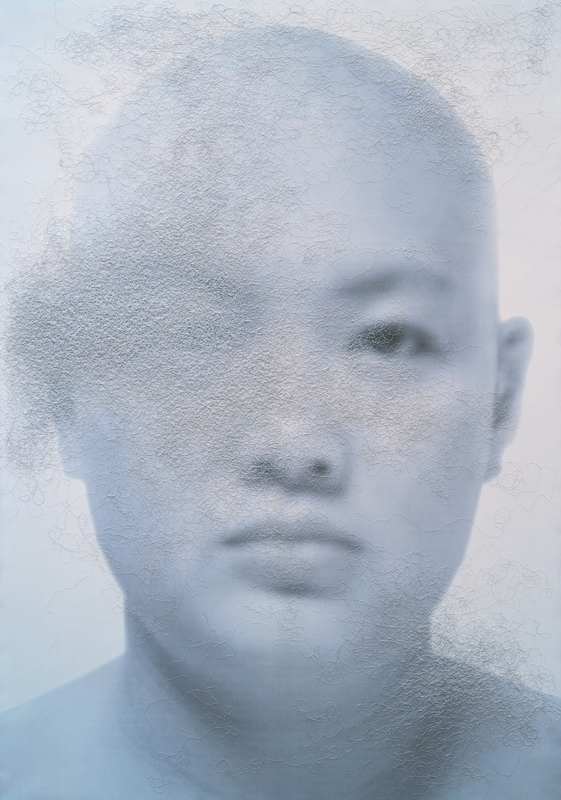 Lin graduated from the Fine Art Department of Capital Normal University in 1984, and exhibited her paintings in youth art exhibitions at the National Gallery of China in Beijing in 1984 and 1985. She married Wang Gongxin in the 80’s, and in 1988 they came to New York, joining other Chinese artists seeking professional opportunities there, including the politically outspoken Ai Weiwei. Their time in New York proved to be financially difficult; Lin took a job as a textile designer. She also visited art museums and galleries, absorbing the current scene, which included the feminist-inspired work of Louise Bourgeois and Kiki Smith. In 1989 she graduated from the well-known Art Student League, and was in group exhibitions in both New York and Los Angeles, in 1988 and 1993 respectively. In the 1970’s, art in China had begun a major evolution as it changed from the state-dominated to the more individual artist-driven, although the new artistic voices often faced government opposition. At first, their art was heavily influenced by new (to them) European and American art movements, such as Surrealism and Abstract Expressionism, taking them away from the former state-sponsored socialist realism, and sometimes toward political protest. Artists such as Tianmiao and Gongxin began forming collectives to support each other and create exhibition opportunities. In 1989 some of these artists were invited to show their work in Paris, and exhibitions around the globe soon followed. In the early years, the dominant form used was painting, but in the late 1980’s many artists began exploring newer art forms such as installation, video and performance, using Chinese mythology and traditions as their source, often to comment on current social issues and changes, for example the modernization and commercialization of the country. Eventually artists’ visions became more personal, as they matured and took their place in the contemporary international scene. Her first major installation work, Bound and Unbound, shown in 1997 in Beijing, is an archaeological landscape of 548 still life objects (small- to medium-sized household items), all tightly wrapped with white cotton thread. It consists of bottles, dishes, baskets, teapots, pots, etc., which when wrapped leave their former modest function to become transformed objects of contemplation. On a “screen” of threads, a video with sound shows a hand using scissors to cut hanging threads. The objects’ white covers appear as pristine and unified as new snow, a George Segal group of figures, or a Malevich white-on-white painting from the early 20th century. A work from 1998, Tree, (third image) shows leafless, wrapped white branches suspended from a hole in the ceiling to a few inches above the floor, where there is a pile of string. A recording of bird chirps can be heard. Another figural series from 2009, Gazing Back, Nos. 1 through 6, plus Procreating and Badges, which was created especially for the Shanghai Pujiang OCT 10-year public art project, is very striking. All of the large sculptures hang on the museum’s outside walls. NOTE: The links for Lin's works from No.1 thru No. 6 below can be found on her website, www.lintianmiao.com - click on her name, then on Selected Works, click on '2009 Gazing Back, No. 's 1 thru 6 to view the site-specific works individually.) No. 1 consists of a white fiberglass female form in front of a large circular mirror; she is gazing into the mirror with a head that is half-monitor, half-anteater in shape. No. 2 consists of a white female who is squatting and laying eggs that trail behind her, an allusion to Lin’s ambivalent feelings regarding her own pregnancy. No. 3 is a headless female seated figure with her back to the wall, holding a long gold belt. No. 4 is two reclining female figures who appear to be coming out of the wall from the front and back on opposing walls. No. 5 is two stylized, animal-like white figures facing each other, one with the wide monitor/anteater head, and the other with a large monitor/receptacle-like head. The figures are suspended away from the wall, with their feet standing on “nothing.” No. 6 is a large headless white vertical female form parallel to the wall, who is holding a gold skull. Behind and above her are large stainless steel insect-like wings. This figure reminds me of the Greek statue Nike of Samothrace (goddess of Winged Victory), in the form itself, as well as the expression of triumph. In the commentaries I researched for this profile, the idea of gazing back was mentioned as being the female gazing back at herself, rather than the traditional male gaze at the female. Also, the new female gaze could be a mutual gaze, one of equality, rather than the traditional dominance/subservience correlation. More works (from 2011) are the series All The Same, which includes forms of combined synthetic bones and hand tools, such as hammers, hung in a straight line high on the wall. They are wrapped in brightly colored silks in a prism progression. A 2012 wall relief sculpture, Golden Mean, (scroll down) contains scattered “bones” arranged pictorially, wrapped in bright gold silk thread on a geometrically divided plane of gold silk. In art, the term golden mean refers to an ancient method of dividing up pictorial space into harmonious compositional areas, that is mathematically based. The bones for Lin were associated with her mother's recent death, as well as the awareness that living things are basically "all the same" in this regard. When I look at some of her figures, I think of past figural sculptures (though I’m not suggesting a conscious derivation). One is the Chinese Terracotta Army, (scroll down for photos) part of the first emperor’s burial tomb that was created around 200 B.C. Despite many differences, there are commonalities. The figures in Here? or There? have the dignified, motionless stance of the emperor’s soldiers. Seven hundred thousand laborers were used to create the army of 8000 and the horses; as many as 20 workers completed Lin’s tediously wrapped sculptures. Tianmiao and the army both came from neighboring interior Chinese provinces. The terracotta army was discovered in 1974, when Lin was about 13 years old; she would perhaps have heard about the discovery. Both of the sculpture types are in a burial-like setting, with artifacts, bones, funerary costume, etc. associated with decay – one literally, and one by artistic expression. Both sculptures were brightly colored (the paint on the warriors had mostly flaked off by the time they were discovered). Both forms of sculpture took a very long time to complete – the thread winding could take months for each piece, and the army and horses took over 30 years to create (with ceramics). Finally, there is the sumptuous silk fabric of some of Lin’s figures, that is reminiscent of the splendor of the emperors’ courts. Are her figures a female (buried) army? Lin has spoken of her need to feel a physical reaction in herself to an external stimulus before she can create art from it. An example would be her sculptures referring to her pregnancy. Her use of materials commonly used by women is an example of how feminist ideas live in her work, as well as her interest in the historical vocabulary (in Chinese and English) used to describe women and their roles in the world. (The number of words pertaining to female occupations has increased in the last 50 years, reflecting the increased options available to women.) But Lin has said that she is more interested in the psychoanalytical than in (women’s) social issues, which places her close to Louise Bourgeois. Her work has been compared to Kiki Smith’s feminist work, which opens up questions about the Eastern versus the Western experience. Certainly in the last 40 or so years, China has come closer to the materialistic and democratic culture of the West, but the political, philosophical, religious, economic and social histories are still far apart. It is easier for an artist in the U.S. to speak out on political or social issues, for example (they are not risking their freedom by doing so). Although the U.S. economy had been currently stressed, our historical position has been that of higher standard of living; our deprivation and lack of modern conveniences for the most part has not been severe for hundreds of years. Having been relatively free for centuries, and mostly free of domestic warfare, it would be hard for us to comprehend the realities of many other, less powerful countries. I can see similarities between Tianmiao’s work and Smith’s early work in a formal sense – that is, many of their sculptural forms have the inventive quality of pre-Columbian pottery and African sculptures, (scroll down the page) such as organic forms emerging from manmade geometric forms, their use of natural elements such as bones, shells and feathers, and the changing nature of their forms. (Also, in traditional art, including Chinese, artists deliberately avoided exact realism in order to expand their formal options, and to express the inner truth, rather than the outward truth, of their subjects.) But when I look at Tianmiao's and Smith's sculptures, I think of Lin’s as being environmental, rather than one or two figures. And of course their work deals with female issues, Smith perhaps in a more socially engaged or polemic way, from a tradition of worldly Western artistic upbringing (her father was the modernist sculptor Tony Smith), whereas Lin’s view sees women as half of the human condition. There is a specificity in Smith’s religious concerns as well, whereas Lin’s work has a strong universality. Tianmiao feels that Western and Eastern viewers view her work differently; Western viewers see it more globally, and Eastern viewers see it with a more regional identity. She was included in a 2013 show in Australia at the Tarrawarra Museum of Art called Animate-Inanimate, where she had a work called Reaction (at above link), which was a series of assemblages wrapped in bright pink satin thread. One of these was a trumpet and a synthetic skull, where the trumpet penetrated the skull above the eyes and continued out the back of the skull. Aside from the shiny satin-like surface, which creates a different sensibility than her earlier cotton-wrapped forms, there is the inventiveness of the resultant form itself. Tianmiao has said that her work is mainly concerned with formal elements (the beauty lies in the forms themselves, as well as their expressiveness). She has said that these "assemblages of bones with manmade tools give form to life after death," also referring to her other assemblages that combined synthetic bones with manmade tools, such as pitchforks or hammers. 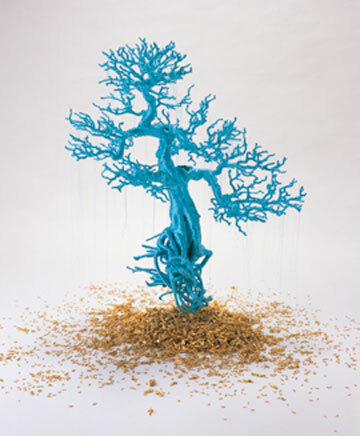 Another silk-thread-wrapped object from 2012 was Bonsai Tree, resulting in a turquoise-colored bonsai tree with all of its bare branches wrapped. There is something visually magical about this natural object wrapped in shiny silk, and the many gold-painted tiny human forms scattered around its base. Another installation from 2014 was Protruding Patterns, shown at the Galerie Lelong in New York. This consisted of a room-sized floor covering of antique Chinese carpets that were sparsely covered by yarn-made raised text in monochromatic reds and pinks. The words were a result of years of research into how women have been described or called, in a few different languages, including Chinese and French, some words positive, some negative. In 2016 she participated in the Setouchi Triennale with a work called Rotation Revolution, parts 1 and 2. Part 1 (on bottom of page on left) is a large steel rod structure that rotates, and a multitude of flea market-type objects were hung on it, some of them wrapped in satin threads, from a 1950's wall clock to other kitschy objects. Again, the shine of the industrial/manufacturing steel signifies a different direction for Tianmiao, away from the handmade women's materials she is known for, a shift she is said to have made in 2015. Part 2 (at her site, click on her name, then on Selected Works, then on 2016 Setouchi_Triennale, Rotation Revolution, Part 2 (second one down on top of left side column) consists of a steel-rod based mobile on the floor that contains another flesh-colored-silk-thread-wrapped form that includes a pitchfork. This combination of manmade, masculine, dangerous tool and finely wrapped flesh-colored silk is unnerving, but visually and formally satisfying. Some of her other pieces are stylized abstract forms coated with polyurea, that have a more manufactured nature than her earlier organic forms. ​In 2017, she switched to working with glass, in conjunction with the Shanghai Museum of Glass, and will be having a summer 2018 exhibition at the Rockbund Art Museum showing the results of this collaboration. There were also two advisors to the show who come from the Guggenheim Museum in New York. This new show, called Systems, consists of bright green, white and pink cylindrical towers with rounded tops, and appears to be again pointed in the direction of the fabricated and masculine. She says that the show is concerned with art, science and technology, and four kinds of consciousness: individual, collective, public and ultimate. The definition of feminism is "advocacy for women's rights on the basis of equality of the sexes," which connotes a political/social protest of sorts. Even though women artists may work with 'women's' materials and experiences, they aren't necessarily or consciously feminist in their work. Are male artists consciously masculinist in their work? Like all marginalized groups, women artists are forced to think about this, and deal with the fallout, like Georgia O'Keeffe's early flower paintings which consistently appeared as female anatomy to male critics, to the point where she stopped painting flowers to get away from the irritant. As a woman artist myself, who started drawing at 8 and painting at 10, the idea that I was a female artist never occurred to me, as it still doesn't. Like any man, I am simply an artist, affected by my experiences, like all artists, and using materials I am most connected to. I think this is what Tianmiao is saying about her work: that she is concerned with the rights of all people to equality and self-fulfillment. She has said that she is concerned more with the human condition and the language of art itself, that "the artist's individual experience is paramount when it comes to making art," (interview in the Brooklyn Rail, 2017). I think her way of making art is pretty traditional artist behavior, coming from Kandinsky's "inner necessity." She has said that until recently men have established the criteria for women, and that now women have to create their own criteria with which to judge their work. Her materials have a wide range, and like a conceptual artist she chooses the materials to fit the individual work. She says that it is fun to push her work to its limits, including with materials - to try things that are 'impossible' and make them work. When she was working with marble, she wanted to have thin, delicate forms, which is very difficult to do with marble, but she felt that in order for the work to succeed and express what she wanted, she had to find a way. I agree that this is part of an artist's job, and an artist's satisfaction.